Something has happened to ducks. At least that's the prevailing belief among Minnesota hunters, who say last fall's duck season was the worst anyone can remember. No one knows for sure why hunters are not seeing ducks, but many believe habitat loss is to blame. Ordinarily, the grumbling might end there. But since December, a tenacious Twin Cities newspaper columnist has been prodding his fellow duck hunters to do something about the problem. Hundreds have responded to his call including environmentalists, who don't traditionally favor hunting. This unlikely group of allies will join forces at the capitol this weekend to rally for ducks, wetlands and clean water. St. Paul, Minn. — Dennis Anderson has lost track of how many grumpy tales he's heard since last fall's duck hunt. But he does know that no matter who tells the story, it's always the same. "You can ask people from Baudette to Winona; Worthington to Ely," says Anderson. "There were no ducks." Anderson hears his fair share of hunting tales. He's an outdoors columnist for the Minneapolis Star Tribune. He's also a duck hunter. And like most, he's used to getting shut out from time-to-time. But Anderson says the past few duck seasons have been so bad that he knows something is seriously wrong with the duck population. That's why he suggested the rally. "Without some action, without actually taking this seriously, we're probably on our last legs of huntable populations in Minnesota," Anderson says. "There will always be ducks around, but there needs to be a certain critical mass." The Department of Natural Resources says some critical mass of ducks can be found in the spring. That's when the DNR counts breeding pairs. So far the agency says it has not detected a significant drop in those bird numbers. But the agency doesn't dispute that something might be happening in the fall. The DNR doesn't count ducks at that time of year, except those killed by hunters. That's not considered an ideal gauge of the number of birds in the air. DNR Waterfowl Specialist Steve Cordts says hunters probably have a better sense of what's going on. "Certainly from the number of negative hunting reports we've had we're aware of a problem," says Cordts. It's possible the birds have been lingering longer in Canada because the fall weather has been unusually mild in recent years. Or Cordts says there might be too many hunters. It's also possible a more serious problem is leading to a decline in duck numbers. Cordts and his DNR colleagues have their suspicions. "Our feeling is that it's a habitat issue; wetland degradation, water quality." Most ducks need access to healthy wetlands to thrive and raise their young. In Minnesota, wetlands are protected. The state has had a law in effect since 1994 that ensures no further net loss of wetlands. But a recent DNR report says since 1995, the state has lost more than 11,000 acres of wetlands. Only 6000 of those acres were replaced elsewhere in Minnesota. It might not sound like a massive loss of duck habitat. But scientists say such losses are significant because Minnesota has so few historic wetlands left. So every time a wetland is removed from the landscape, more runoff is diverted to the remaining wetlands, which are getting deeper, muddier, and weedier and less inviting to ducks. Hunters believe wetlands loss is why they rarely see northern pintails, canvasbacks, redheads and widgeons anymore. Minnesota used to have at least a dozen species of waterfowl that appeared regularly in the state. But now it's down to three: mallards, blue wing teals and wood ducks, all highly adaptable species. On a recent drive around the outskirts of Stillwater, Dennis Anderson points to a cluster of new professional buildings. Six months ago the site was a small urban wetland. No longer. "They literally filled into this wetland," says Anderson. "This was a wetland." You can still see signs of it. Tall wispy pines surround the buildings. And a long, narrow pond separates the nearby highway from the offices. "Now of course if you drove by you think well they have a cute little pond around their new buildings here," says Anderson. "But lost in that process is again the ability of this remaining wetland to support the kind of wildlife that we in Minnesota have all come to know and love over time." There's nothing illegal about this development. But Dennis Anderson thinks it should be. He says Minnesota wetlands law is too lenient. Exemptions allow Twin Cities area developers to destroy some wetlands. Sometimes they have to be replaced. Sometimes they don't, especially if the wetlands are considered marginal. There are also some exemptions in agricultural areas. That's where most of the state's wetlands are located. University of Minnesota wetlands expert Susan Galatowitsch agrees there are many loopholes in the state's law. "It (the law) was the easiest first thing to do," says Galatowitsch. "Absolutely. But we understand more than ever that it simply wasn't adequate to sustain waterfowl." But even if Minnesota perfectly protected all of its wetlands, Galatowitsch says some ducks might not return anyway. Many species have left because they can't find enough grassland to build their nests and hide their young. Galatowitsch says that kind of habitat is under even more pressure than wetlands. "The areas that are adjacent to wetlands, those critically important grasslands are much less protected by law," says Galatowitsch. "And really there's a lot of incentives to not protect them." The last farm bill passed in 2002, was filled with incentives to encourage farmers to plant as many crop acres as possible. Faced with low prices and slim profits, many farmers took advantage of the subsidies and tilled up as much ground as they legally could, sometimes right up to the edge of their wetlands. Others tried to boost their yields by installing new and improved field tile that quickly whisks away water, virtually eliminating the shallow field pools that attract ducks. But blaming farmers doesn't sit well with Osakis crop farmer Bob Mostad. About 130 miles northwest of the Twin Cities, Mostad pushes past prickly bushes and a thick mat of weeds to get to a frozen water channel running along the edge of his field. The ditch feeds a small cattail-fringed wetland that looks like it's always been there. Fifty years ago it wasn't. Mostad says it was a low-lying pasture. "We could have tiled it all out and put in a pump and made good farmland out of it," says Mostad. "But we couldn't afford it and I didn't want to in the first place." Mostad is an avid duck hunter. He says he resisted the allure of government payments to have his own personal wetland for ducks. But he doesn't expect other farmers to do what he did. He believes if farmers received cash payments to create or preserve this type of habit, many would do it. "The ground that we walked over now, I get paid nothing for it and yet I've got to pay taxes and I don't mind you know. I feel it's my obligation," says Mostad. "But you know if there was money available and they treated farmers decent, there'd be duck habitat like you wouldn't believe." Mostad says if Minnesotans want more duck habitat they should be willing to offer a price that's competitive with the federal government's farm subsidy programs. Organizers of the rally for ducks agree. In the Twin Cities recently, nearly 50 people turned out for a last minute pre-rally meeting. 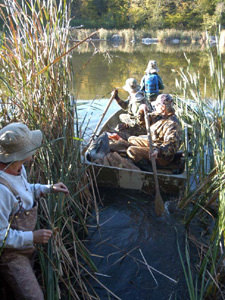 Dozens of organizations are there, from the Izaak Walton League to Audubon to Ducks Unlimited. Some landowners are taking part as well, but the group admits it has some work to do to draw in more of them, including farmers. Tom Landwehr, with The Nature Conservancy, says organizers realize that most of the wetland and prairie habitat in Minnesota is privately owned and it will probably stay that way. "There is no eminent domain for conservation and nobody's advocating that," says Landwehr. "We're saying this should be based upon a fair reimbursement for what a landowner's giving up." How to pay for wetland and prairie improvements is a question for another day. Rally organizers want to find out first if Minnesotans care about this issue. They'll gauge that by seeing how many people attend the rally at the state Capitol. Columnist Dennis Anderson is hoping for a turnout of thousands. "If no one shows up, that's who we are, you know? If no one makes some sort of move or effort to make this better for themselves, then that's who we are," says Anderson. "I have sort of a deep belief that that's not who we are." In the meantime, some Minnesotans have suggested that the state close the duck season for a year or two to see if that will help the birds recover. The DNR doesn't think that option is necessary yet. The agency points out that it still doesn't know exactly what's happening to ducks. There could many reasons for their decline and it's possible that some of those reasons haven't even been considered yet.